During high demand, Cheyenne disinfects approximately 2 million gallons from well fields at an off‐site location from the water treatment plant. This off‐site location used a calcium hypochlorite disinfection process that required frequent, recurring maintenance. 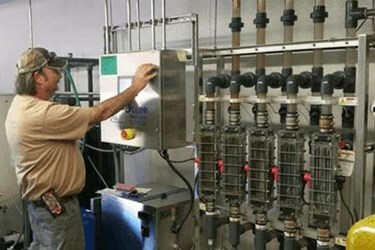 To reduce costs, the BOPU investigated alternative methods for disinfection. BOPU staff eliminated chlorine gas and bulk commercial bleach (12% concentration) disinfection processes due to safety concerns and determined that an on‐site sodium hypochlorite generation system (OSHG) as the best option for reducing maintenance. The BOPU ultimately selected the Microclor® OSHG system manufactured by Process Solutions, Inc. (PSI) as the system that met their needs by generating the disinfectant with only water, salt and electricity. The Microclor® OSHG system also allayed concerns of hydrogen accumulation because it is the only system with vertical electrolytic cells that vent hydrogen passively away from the generation area.